There are frequent debates in our workshops about whether the time andÂ effort spent on building a Facebook marketing or brand experience is worth it. Is it really positive when it comes to return on investment? Let me walk you through an interesting example of an ROI evaluation of an Indian brandâ€™s community on Facebook. 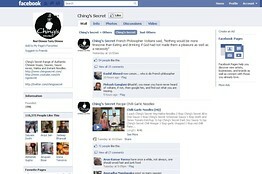 Chingâ€™s Secretâ€™s Facebook community has around 120,000 fans. 1. A half page ad in a city tabloid (with a circulation of around 100,000 readers) costs around 200,000 rupees ($4,350). The â€œopportunity to seeâ€ as defined by the same tabloid is around 300,000 (100,000 multiplied by three, the average number of readers per household). In reality, only a fraction of readers actually see the advertisement. 2. The OTS of any message posted by an administrator of Chingâ€™s Secretâ€™s community on Facebook is 18,000,000 (120,000 multiplied by 150, an average number of connections on a Facebook user page). Surely, this number is theoretical and will never happen. However, to whatever fraction you may want to discount this number, the final number of people who will see the message will still be much larger than the reach of an advertisement in print. â€“Recurring Cost: To reach out to the same readers they reached earlier through print, they will need to pay for every new advertisement. InÂ the case of Facebook, itÂ doesnâ€™t cost them any money for a new message. â€“Engagement Level: The quality and quantity of engagement on Facebook far surpasses the potential engagement opportunity in print. According to the company, they can expect 0.5% to 1.5% of fans to engage with their message on Facebook. In the case of print, if they present an opportunity for readers to respond through an SMS, they can only expect 0.2% as the response rate. â€“Visibility: In theÂ case of Facebook, they have complete visibility of their audienceâ€™s profiles while they get negligible visibility through print. â€“Virality: Finally, the opportunity of their existing Facebook fans bringing new fans or influencing other peopleâ€™s decisions toward their brand almost doesnâ€™t exist in the case of print but is exponential on Facebook. These are smart rules of thumb that can be applied to any business, small or large, while measuring or planning a Facebook presence in a marketing plan.Â I look forward toÂ hearing about anyÂ arguments or models of evaluating Facebook effectiveness for business growth. This article was originally published at WSJ. I go the Fan clubs in social network are a spooky throwback to the Cambrian era in the evolution of social CRM â€“ i.e.species appearing at rapid speed. What really happens is we have too many immature vendors chasing a cynical customer base. Social channels stop at generating “buzz” around a product. But “bulk” still comes from traditional channels, a brick and mortar store around the block. And traditional channels that generate majority of sales have no correlation to Twitter follower counts or blog page views and other metrics we covet in social world.